If you’re looking for a fun, family-friendly activity to fill your remaining days of summer, why not take a boat to the beach? Check out the video to see how easy it is to get from downtown Long Beach to Seal Beach via a quick boat ride across the harbor. Long Beach Transit operates the Aquabus and Aqualink water taxis, and weekend service starts around April and runs through October. Everyday service runs from Memorial Day weekend through Labor Day weekend. Boats depart approximately every 30 minutes. The Aquabus is smaller and circles Rainbow Harbor between the Aquarium of the Pacific and the Queen Mary. The cost of a one-way ride is $1. 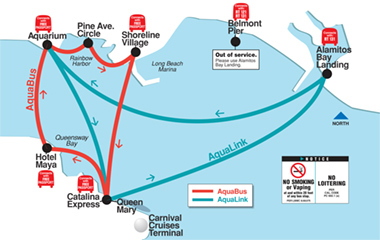 The Aqualink is larger and and travels between the Aquarium, the Queen Mary and Alamitos Bay Landing, where you can easily walk to Seal Beach and enjoy its quaint, small-town beachfront-ness. The cost of a one-way ride is $5. If you pay fare in cash, you’ll need exact change for both. If you have a smart phone, you can download the Token Transit app and pay fare that way. To get to the water taxis via Metro, take the Blue Line to Downtown Long Beach Station. From there, you could walk to the Aquarium of the Pacific or Shoreline Village — it’s mostly downhill and fairly pleasant and takes about 20 minutes. Or take the free Passport bus to the docks. If you choose to start your trip from the Aquarium of the Pacific, use Dock 4. I haven’t used the Aquabus, but I’ve taken the Aqualink twice, and it’s an extremely pleasant experience. The link even has drinks on it (I got a bloody mary the first time I took it on my birthday a few years back). It would be really convenient if the boats took TAP cards and had a validator near the dock, but overall it’s a great activity for sweltering weekends like we’ve been having. In Oslo, the water taxis are part of the metro system. That means the day passes work for them in addition to the buses and trains. Can’t these boats work with TAP? It would make the day pass the thing to have.